Pesce, Pesce – Feast of the seven fishes. In Italy, fish is always eaten on Christmas Eve as tradition. This celebration commemorates the wait, the Vigilia di Natale, for the midnight birth of the baby Jesus. 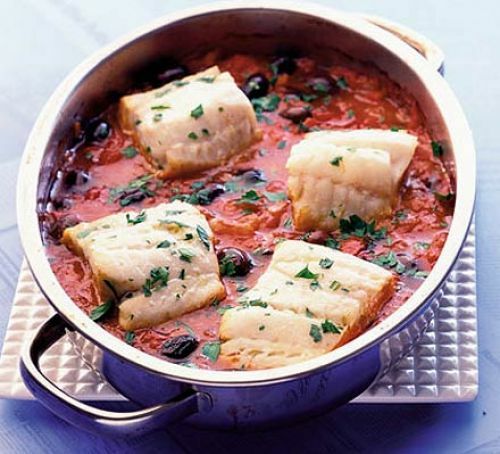 So here is our Cod with tomatoes, olives & capers. Heat the olive oil over a medium-high heat in a large deep skillet/frying pan, then add the onion and fry for around 5 minutes then add the garlic, and stir frequently, until the garlic is golden, for around 2 minutes. Then add the tomatoes, tomato puree, olives, capers, and a generous pinch of crushed peperoncino chilli flakes. Stir to combine.